I started making Em’s Pink Beads Socks, and seeing as a few people had contacted me about knitting with beads, I decided to post how *I* knit with beads. Enjoy! This is how I did my beaded sock. This is not the only way to knit with beads, but this is how I do it. 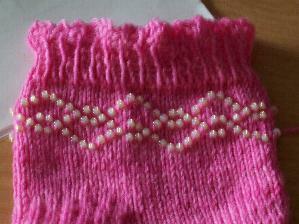 The yarn used in the demonstration is Lorna’s Laces Shepherd Sock, and the beads are size 8/0 Mill Hill beads. First of all, stringing the beads. I use a “jumper” thread. 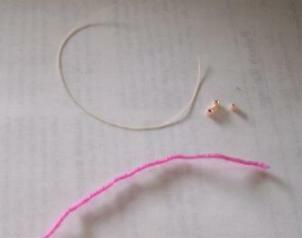 In this case I have used sturdy beading thread, but any thread, even ordinary sewing thread will work. 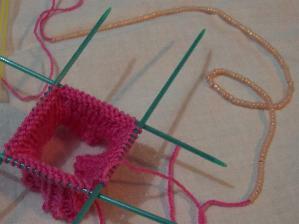 I fold the yarn in half, and fold the “jumper” in half, so that each has a “loop”, then I loop them together. Holding the two ends of the “jumper” together, I thread the bead onto this finer thread, and down over the joined loops onto the yarn. For the beaded socks, there were over 200 beads, so after I’d threaded them all on (no fast task! ), I pushed them down out of the way, then commenced the sock. 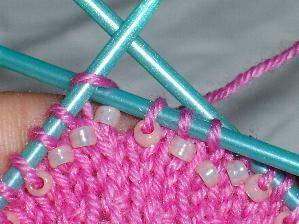 Other people knit the cuff first, then break the yarn, and thread the beads. 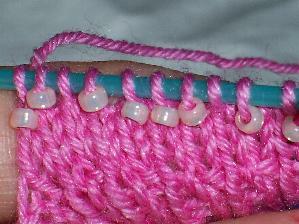 I don’t like to sew in ends, so I do it this way, pushing the beads further down the yarn as I knit the cuff. Now I’m ready to begin knitting the beaded portion. To prepare, I push a bead to the back of my knitting. 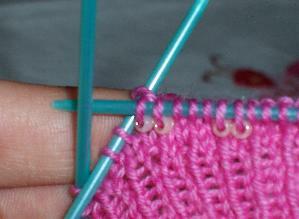 Then, I start to knit the stitch as normal, with the bead close to the knitting. 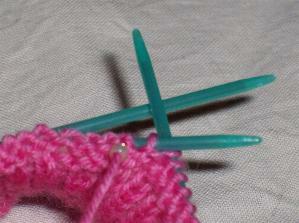 I wrap the yarn around the needle, with the bead sitting between the needles. 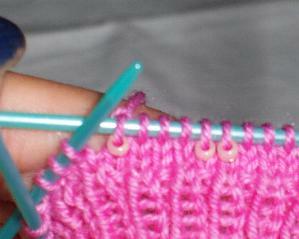 It is important that the bead is securely between the needles. Sometimes it needs to be pushed into place. The pull the stitch through as you normally would. My stitches look like this when I’m done. Continue the first round in the same manner. 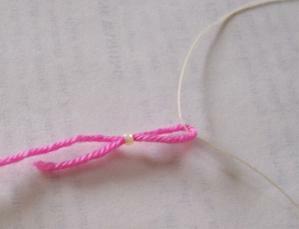 When you get to the second round, be careful of the beads in the stitches from the row before. 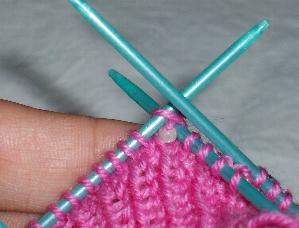 I insert the needle above the bead when preparing to knit the next stitch otherwise I find that the bead escapes to the back of my knitting. 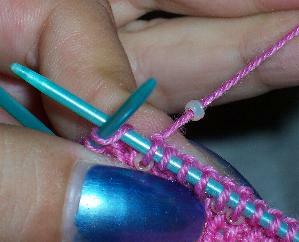 The stitch above keeps the bead in place. Then I finish the stitch as outlined above. At the end of the second row, this is how my knitting looks. The beads sit on the right hand “arm” of the stitch when completed, the next row of beads sit above. There is no need for a spacer row between each bead. After all the rows are done, this is how my pattern came out.